These cookies are best eaten on the day they are made, but are so delicious they are unlikely to hang around for long. Preheat the oven to 180C/Gas Mark 4. Beat the butter and sugar together until light and creamy. Beat the golden syrup into the butter and sugar with the vanilla essence. Mix in flour and chocolate chunks until just combined. Take a teaspoonful of the mixture, roll it into a ball, then place onto a greased baking tray, flattening it slightly with the palm of your hand. Repeat with the remaining dough, allowing plenty of room for the cookies to spread while baking. Bake for 12 minutes until golden brown. Allow cookies to cool on the tray for few minutes before transferring them to a wire rack. 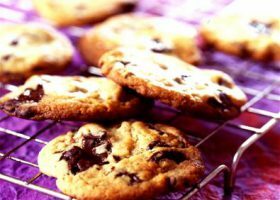 Cook's note To make double chocolate chip cookies, substitute 25g of flour with 25g cocoa powder.